With every post you write from now until Thanksgiving, include a blurb, with or without a picture , of something specific you are thankful for.﻿ My mention of thanks won't be the whole post -- just a blurb. Don't stress about taking a picture if you don't have one. That's it! That's the challenge! Today I begin the challenge by posting a few pictures from some moments my daughter and I shared yesterday as we watched cattle being moved from one pasture to another. As she got off the bus, she came in and told me with excitement that they were moving the cattle! It is just a little oddity about living in the country that is new to us. 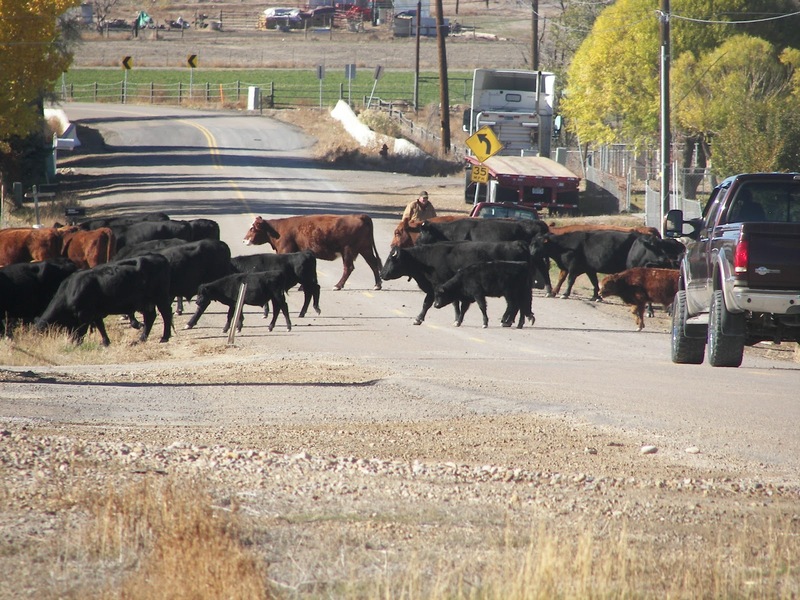 The cattle stop traffic as they cross the road by our home. 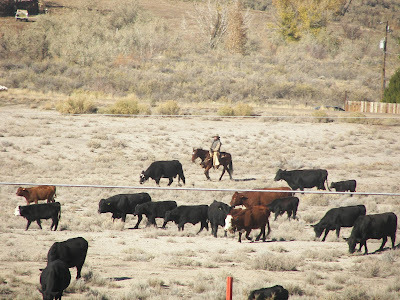 Instead of saying, "That's nice honey," I went outside and watched the cattle being moved --- and enjoyed the moment with my daughter. We weren't disappointed because one of the cowboys in the photo below, had on chaps AND a cowboy hat! We sat and watched and took pictures and moo-ed. My daughter Talley didn't approve of my moo; she thought her moo was more authentic. I am thankful that we shared an enjoyable time watching the cattle. To honor the meaning of Thanksgiving this year, join me in including in our posts,what we are thankful for each day we do a post. Well that is a brilliant idea! I love it. I will do it. Thanks for the challenge Joni! I just did a gratitude post today then saw your blog...lots to be thankful for if we stop and count the blessings. Sweet idea Joni.....hmmm guess I won't be posting too much from now through Thanksgiving. I don't have a blog and likely never will, altho I follow many of you daily. I'll simply "think" my thankful thoughts each day. Today I'm sharing it here, and it's that I'm thankful that I'll be a first-time g-ma in the spring! Looks like you and your daughter got to see a real cowboy in action! Great habit for all of us. I can't help but share a few things I am thankful for right now. First, I am thankful I was able to vote today without fear and that I was physically able to drive myself to the polls as well as walk, talk and cast my vote without help. I find myself taking so much for granted. Second, I am thankful for encouragement, inspiration and friendship in the blogging community. what a fantab idea! I will take that challenge! What a great idea. We do it everyday at the end of the day after we read scriptures as a family and I agree, I have so much to be thankful for. Today I too was thankful for the priviledge to vote, that others who came before us had to fight for and others around the world don't have that priviledge. I also thought today as I read someone's blog about how they were struggling to figure blogging out, that I was thankful for Joni that she showed me all the ropes and kept answering my questions and still does, because I would have given up right at the start!!! Thanks for the inspiration. After a very difficult year, I really need to count my blessings and be thankful. 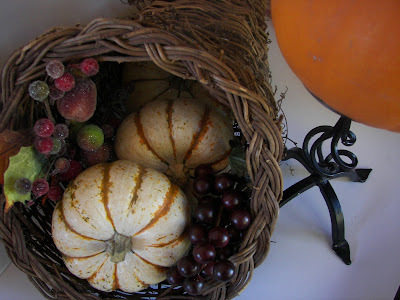 Love the Thanksgiving challenge, it is a great and easy idea for making me stop and count my many, many blessings. And as silly as this may sound...when they move the cattle in front of our home we always go out and watch. We also wave hello to our neighbors, as they ride their horses by, as they are trying to get those cows to where they are going. It just a simple, country pleasure. Visit our site for Andhra Recipes. It is those sweet quiet moments just being with family or friends that make life so great. I took your challenge and posted it to my blog. I am a follower of your blog as well as your sister's. I recently just met her in person, what a sweet lady!! Just love your blog and hope mine will be as wonderful as yours one day. Post my gratitude on my blog today.